Is it True That I Can Get Brand New Teeth in a Day in Dallas? Do you have ill-fitting dentures that you wish you could replace? 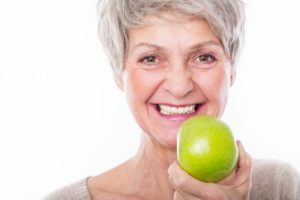 You’ve already had to suffer from tooth loss, the last thing that you want is to face more problems from slippage, irritating dentures that just won’t stay in place. If you’re ready for a more permanent solution to your tooth loss concerns, it’s time to explore a better restorative option: teeth in a day in Dallas! Learn more about how you can leave our office after one visit with a full, new, stable smile. You’re familiar with dentures, but there’s a better option for patients seeking a permanent solution to their tooth loss: all on 4 implants. This is a restorative dental option that combines multiple meticulously placed dental implants and the traditional denture to create a whole new smile! It seems impossible to go from one extreme to another. Some patients enter our office completely edentulous (missing all teeth) and leave in the very same day with a mouth full of functioning, beautiful teeth. Can I Really Leave with Teeth in a Day? The implant procedure is performed in the office in a single day by one of our highly trained oral surgeons. Our practice brings together a team of dental implant experts who take care of every aspect of your procedure while you peacefully sleep through it all—you won’t even remember your appointment or the surgical placement of your implant posts! With the all on 4 dental implant techniques, you can even have remaining damaged teeth removed from your smile and dental implants surgically placed. This will create and a brand-new set of teeth all in your single appointment. Our office can provide teeth in a day utilizing one of the best and reputable implant systems available today: Nobel BioCare dental implants. Our surgeons will work with your restorative dentist, lab technician, and our staff to ensure that you’re completely satisfied with your new, permanent, natural-looking and feeling smile. Why Should I Choose This Option? More stable jaw strength and density. A youthful appearance that will boost your confidence. Avoiding all problems with dentures, including distasteful adhesives. Speak clearly without any complications. Enjoy crunchy, chewy, and healthier foods. A tooth replacement that’s built to last a lifetime. If you’re dealing with an uncomfortable fitting denture or are facing tooth loss, all on 4 implants can be the quick solution that you need. Get in touch with your oral surgeon today! Here at Texas Wisdom Teeth and Dental Implants, we only offer the best solutions to patient’s dental concerns—solutions that will last for a lifetime! Let us partner with you, your restorative dentist, and utilize our resources/specialized training to better your smile. Give us a call today to get started. Comments Off on Is it True That I Can Get Brand New Teeth in a Day in Dallas?